Definition at line 1801 of file CCopasiXMLParser.h. 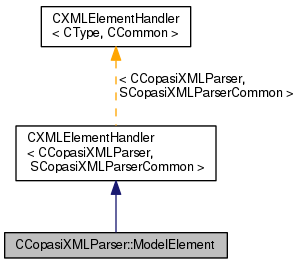 Definition at line 1809 of file CCopasiXMLParser.h. Definition at line 1608 of file CCopasiXMLParser.cpp. Definition at line 1613 of file CCopasiXMLParser.cpp. Definition at line 1834 of file CCopasiXMLParser.cpp. References SCopasiXMLParserCommon::CharacterData, CCopasiMessage::EXCEPTION, CModel::getKey(), CCopasiMessage::getLastMessage(), CAnnotation::getUnsupportedAnnotations(), CCopasiXMLParser::mCommon, MCXML, CExpatTemplate< CExpat >::mParser, SCopasiXMLParserCommon::pModel, CModel::setCompileFlag(), CModelEntity::setInitialExpression(), CAnnotation::setMiriamAnnotation(), CAnnotation::setNotes(), CCopasiMessage::size(), START_ELEMENT, and UNKNOWN_ELEMENT. 1894 // due to incomplete model specification at this time. 1900 // the initial expression. Therefore, we reset to MiriamAnnotation. 1956 mCurrentElement = Model; // This is possibly the last element. 1975 mCurrentElement = Model; // This is possibly the last element. 1980 mCurrentElement = Model; // This is possibly the last element. Definition at line 1618 of file CCopasiXMLParser.cpp. 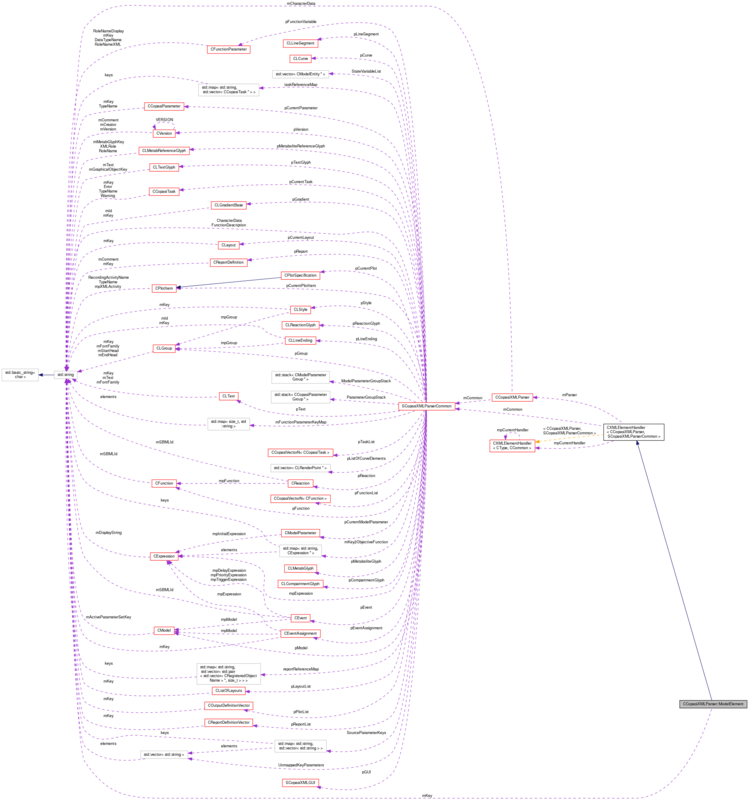 References CModel::AreaUnitNames, C_FLOAT64, CModel::deterministic, CCopasiMessage::EXCEPTION, CModel::getModelParameterSets(), CModel::LengthUnitNames, CModel::m, CModel::m2, CCopasiXMLParser::mCommon, MCXML, CModel::min, CModel::ml, CModel::mMol, CModel::ModelTypeNames, CExpatTemplate< CExpat >::mParser, CModel::OldMinute, CModel::OldXML, SCopasiXMLParserCommon::pDataModel, SCopasiXMLParserCommon::pModel, CModel::QuantityUnitNames, CModel::QuantityUnitOldXMLNames, CModel::s, CModel::setAreaUnit(), CModel::setAvogadro(), CModel::setLengthUnit(), CModel::setModelType(), CCopasiObject::setObjectName(), CModel::setQuantityUnit(), CModel::setTimeUnit(), CModel::setVolumeUnit(), CModel::TimeUnitNames, toEnum(), UNKNOWN_ELEMENT, and CModel::VolumeUnitNames. Definition at line 1829 of file CCopasiXMLParser.h.